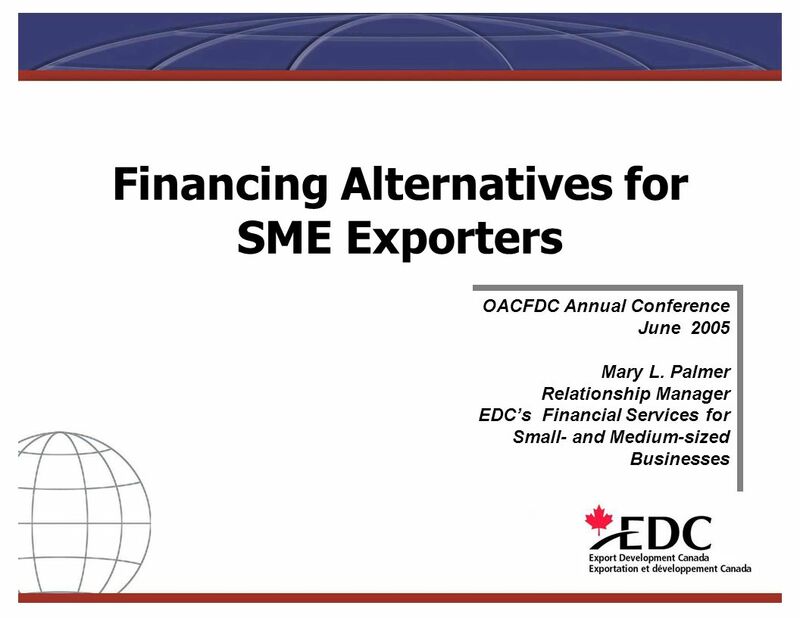 Financing Alternatives for SME Exporters OACFDC Annual Conference June 2005 Mary L. Palmer Relationship Manager EDCs Financial Services for Small- and. 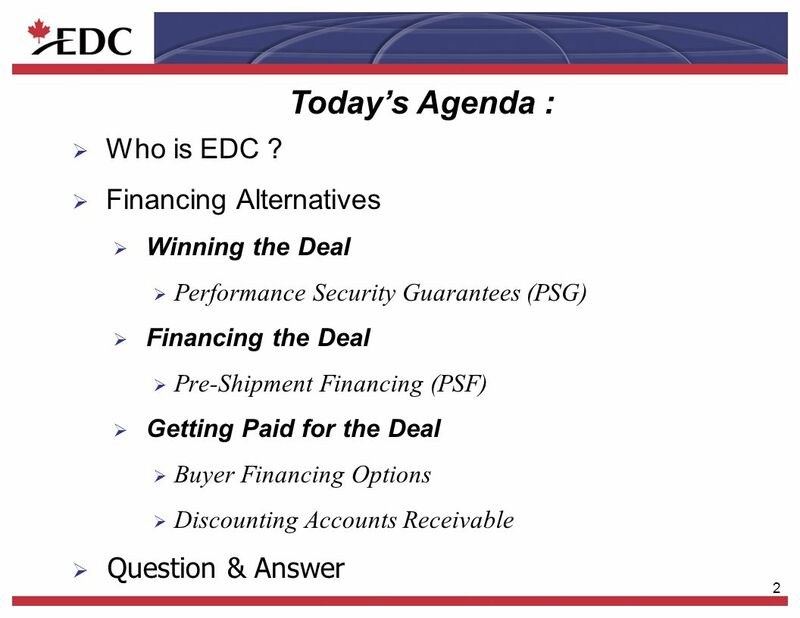 11 11 Financing for Your Buyer EDC can finance your buyer…. 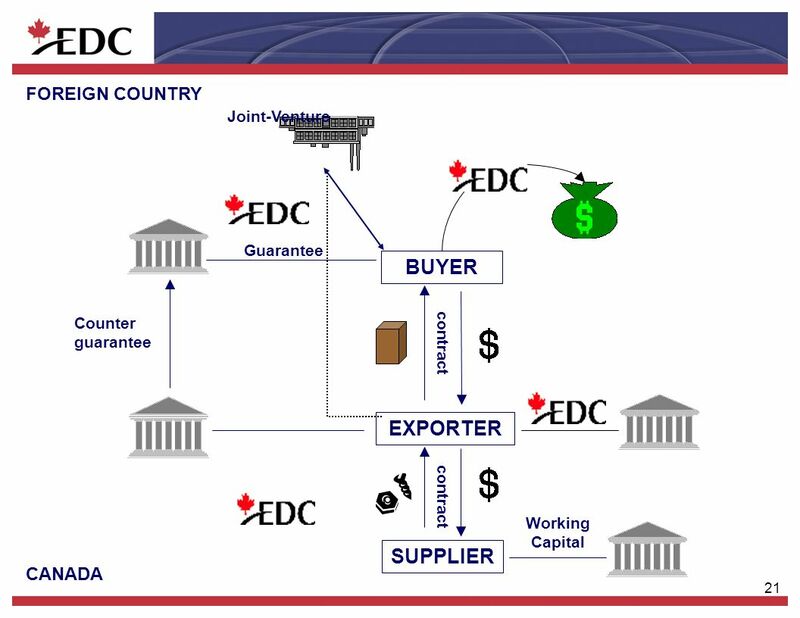 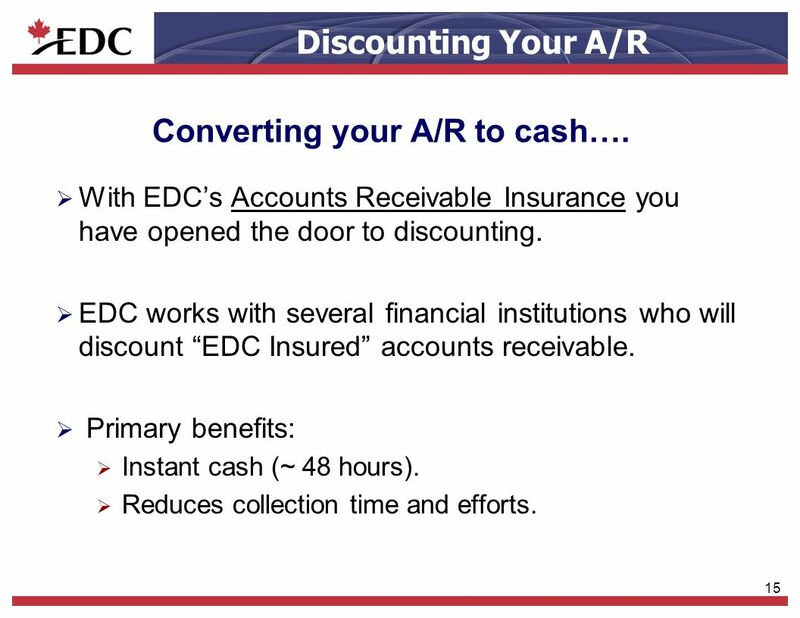 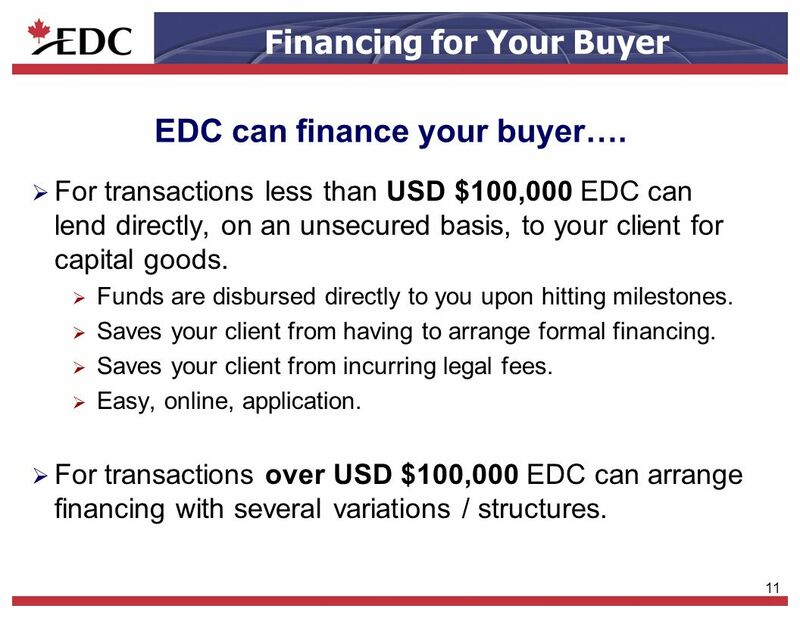 For transactions less than USD $100,000 EDC can lend directly, on an unsecured basis, to your client for capital goods. 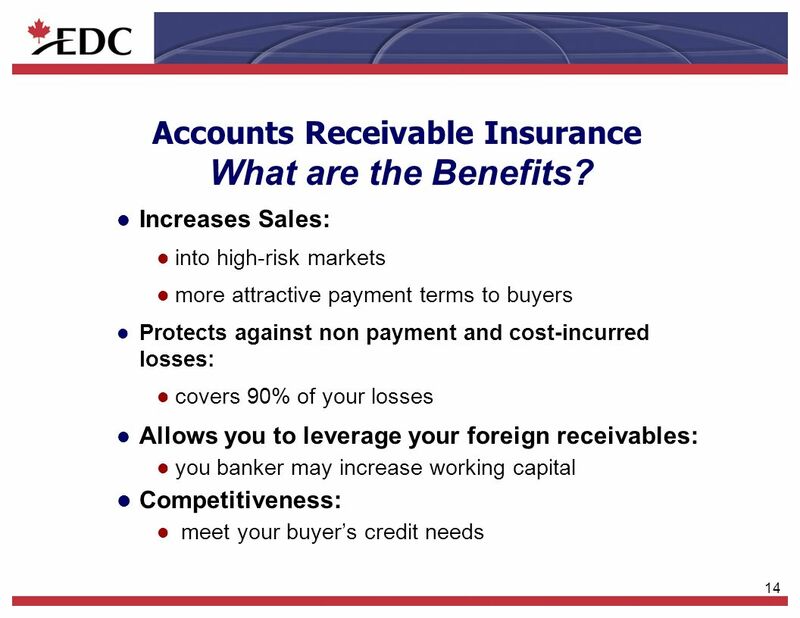 Funds are disbursed directly to you upon hitting milestones. 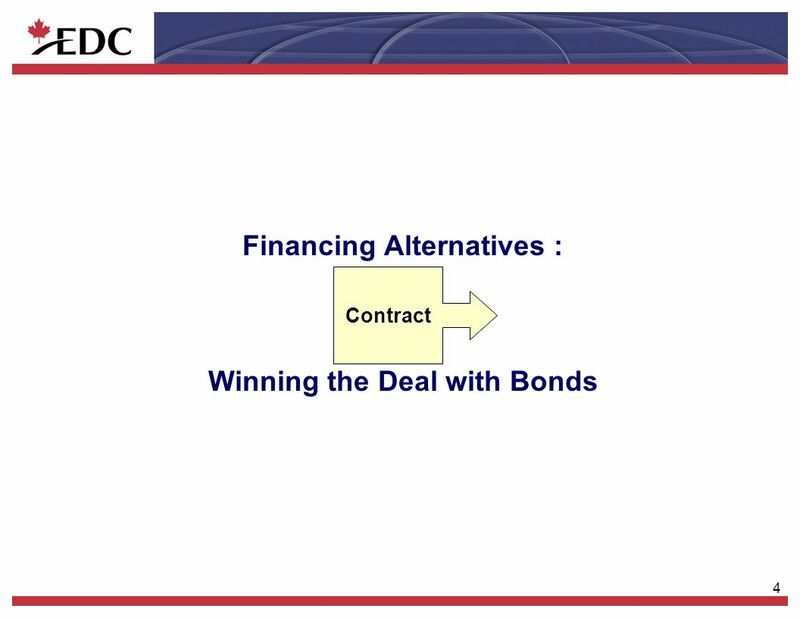 Saves your client from having to arrange formal financing. 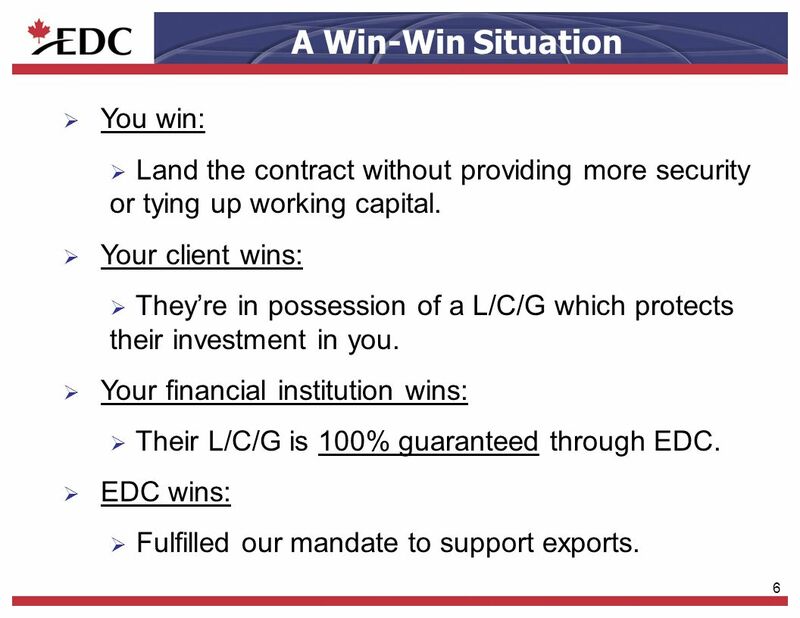 Saves your client from incurring legal fees. 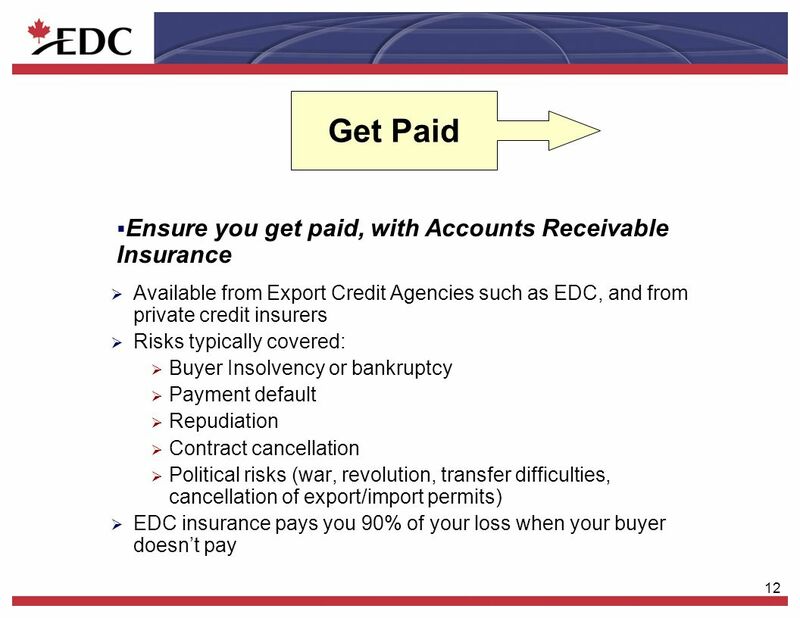 Easy, online, application. 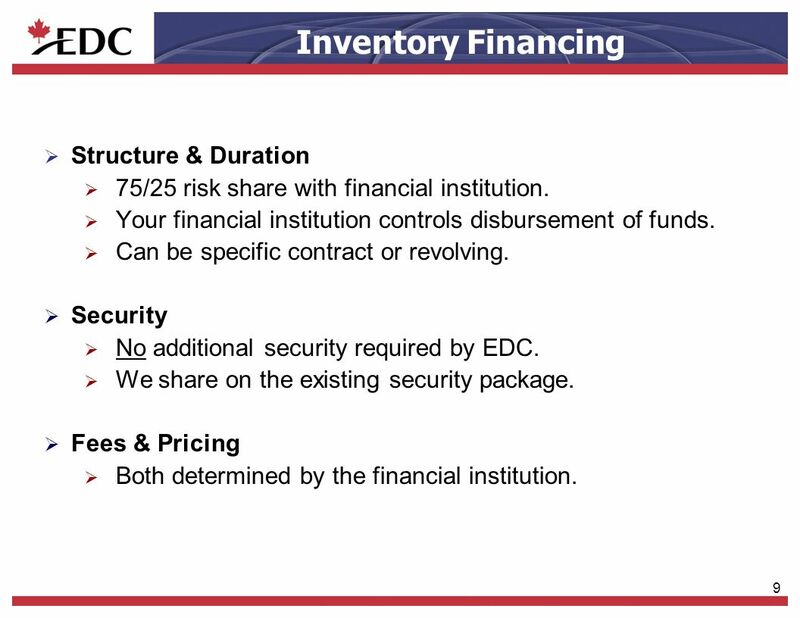 For transactions over USD $100,000 EDC can arrange financing with several variations / structures. 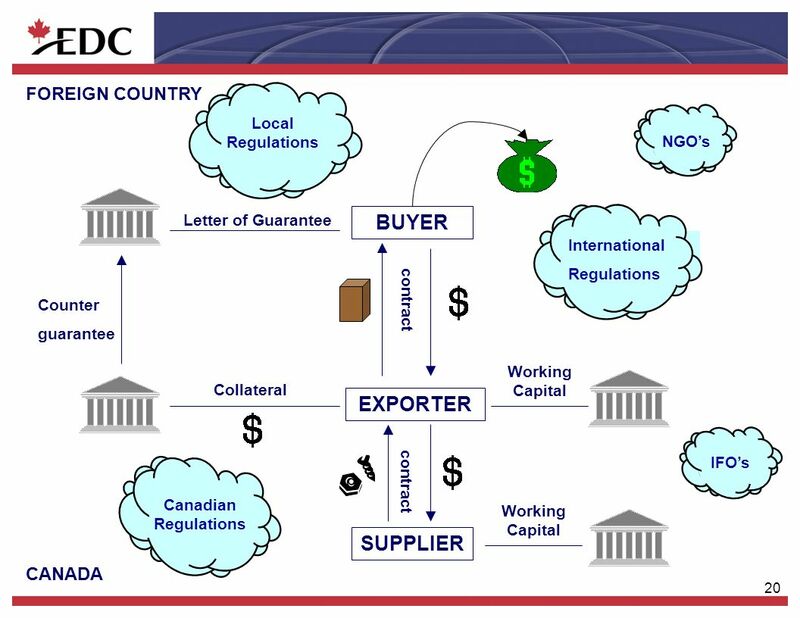 16 16 EDCs eProducts l allows an exporter to promptly determine their buyers credit profile before they close the deal (On-line insurability opinion and D&B Business Information Report). 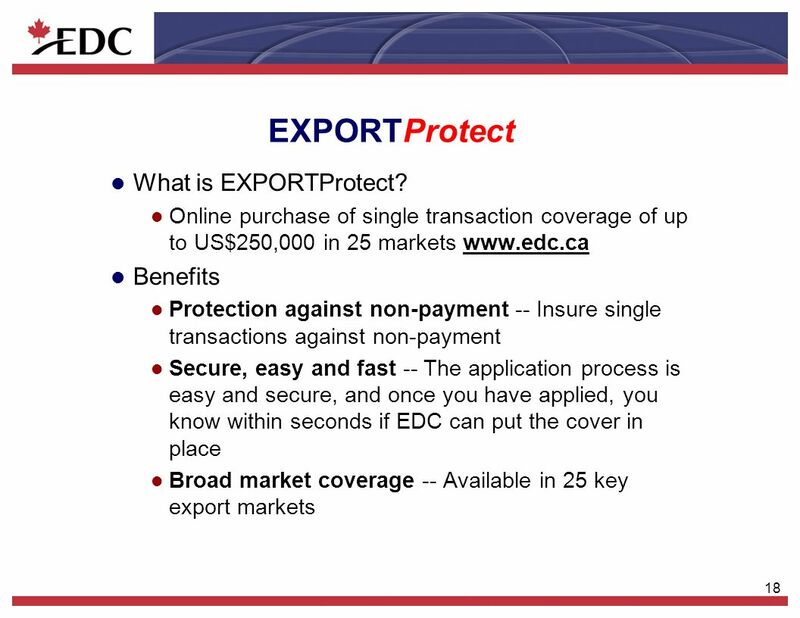 l an export can now insure a single transaction for up to 90% of their loss if a foreign buyer doesnt pay. 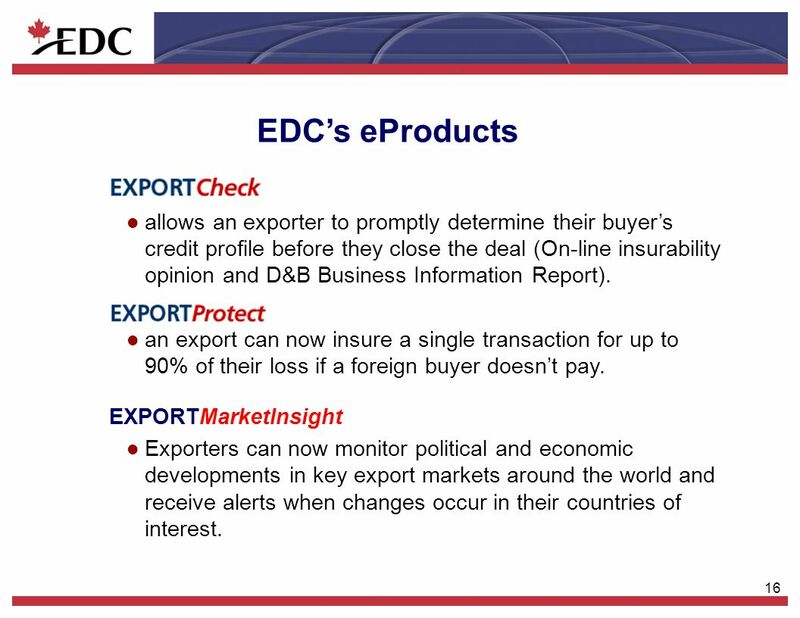 EXPORTMarketInsight l Exporters can now monitor political and economic developments in key export markets around the world and receive alerts when changes occur in their countries of interest. 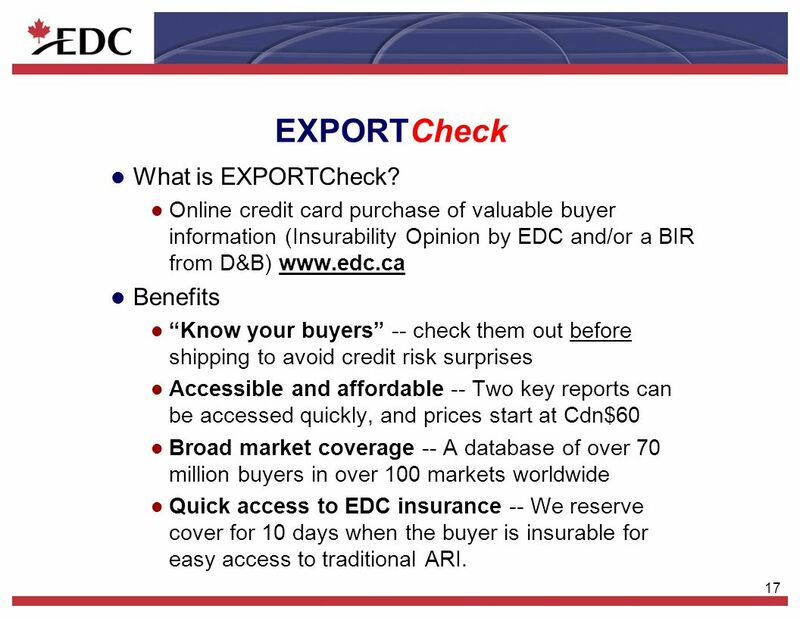 17 17 EXPORTCheck l What is EXPORTCheck? 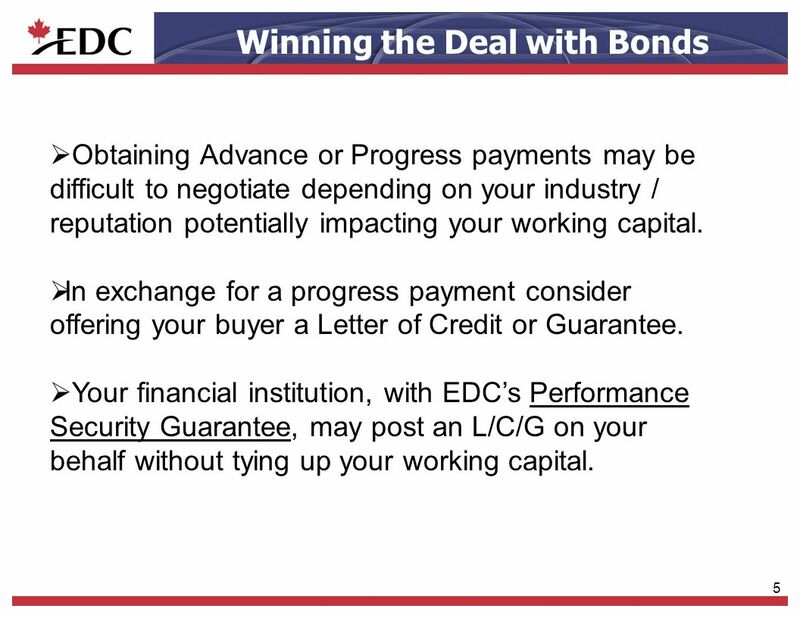 l Online credit card purchase of valuable buyer information (Insurability Opinion by EDC and/or a BIR from D&B) www.edc.ca l Benefits l Know your buyers -- check them out before shipping to avoid credit risk surprises l Accessible and affordable -- Two key reports can be accessed quickly, and prices start at Cdn$60 l Broad market coverage -- A database of over 70 million buyers in over 100 markets worldwide l Quick access to EDC insurance -- We reserve cover for 10 days when the buyer is insurable for easy access to traditional ARI. 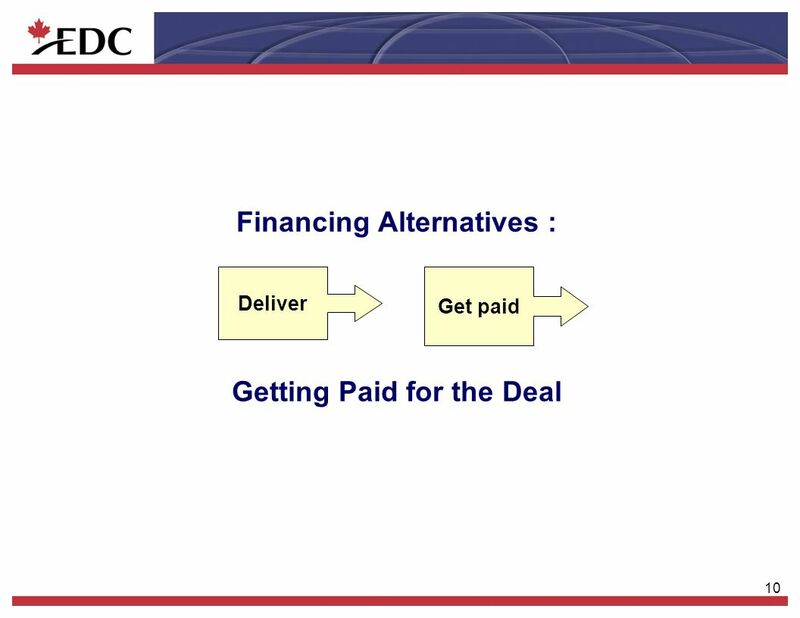 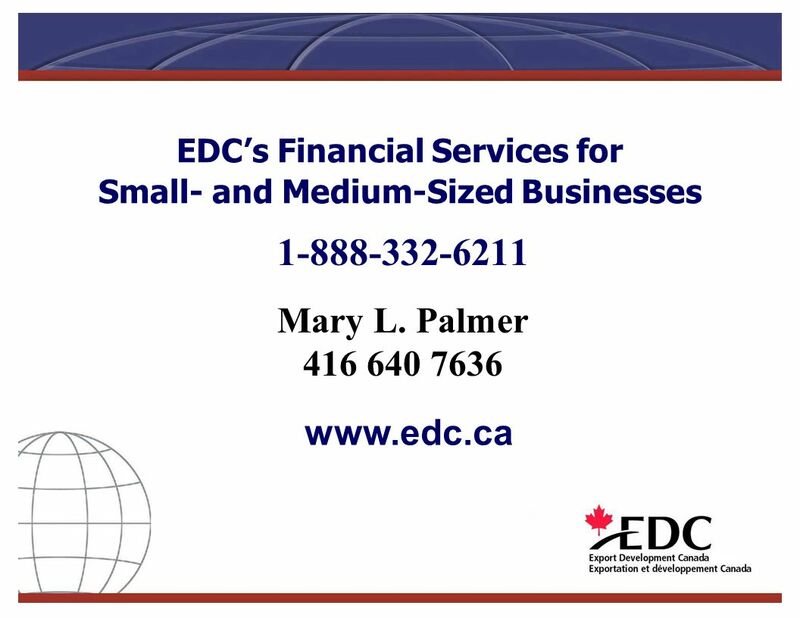 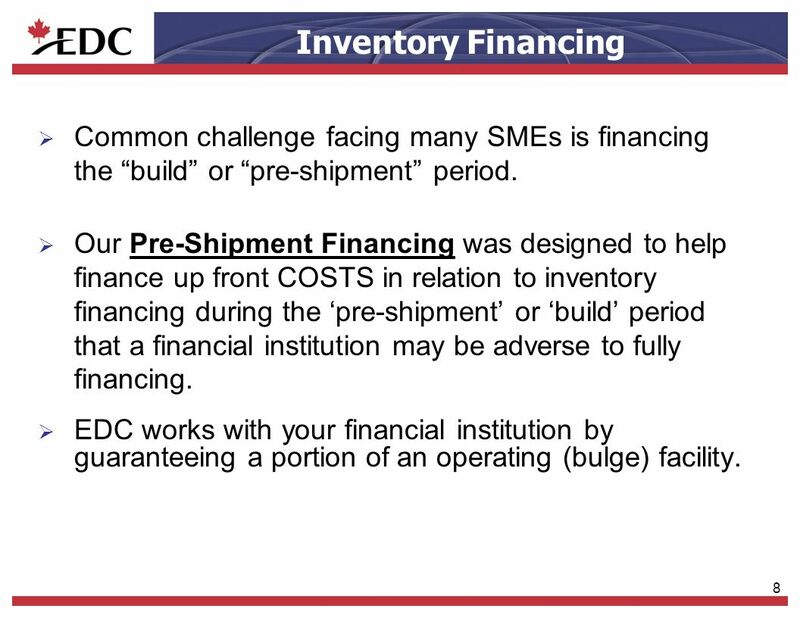 Download ppt "Financing Alternatives for SME Exporters OACFDC Annual Conference June 2005 Mary L. Palmer Relationship Manager EDCs Financial Services for Small- and." 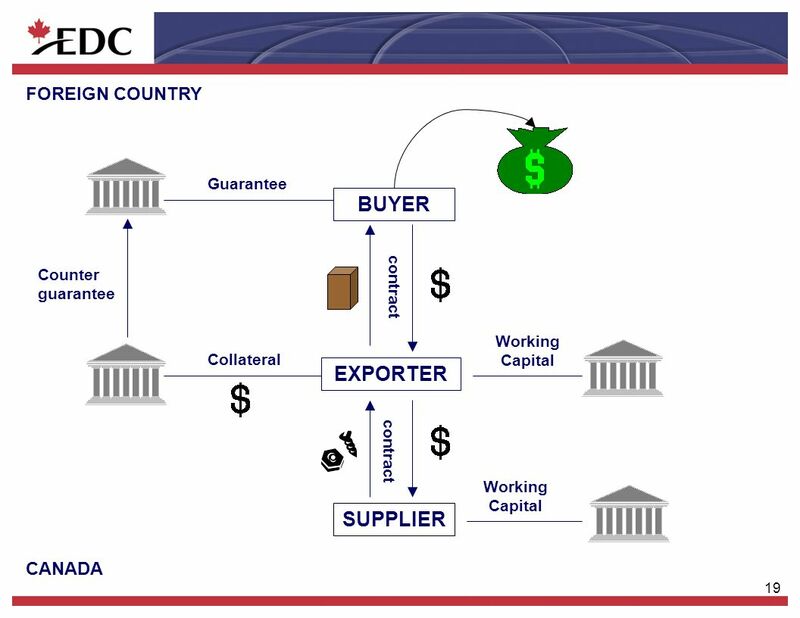 Mitigating Risk Inherent in International Trade AMCHAM: Doing business with Colombia Wednesday 6 th April & Tuesday 12 th April, 2011. 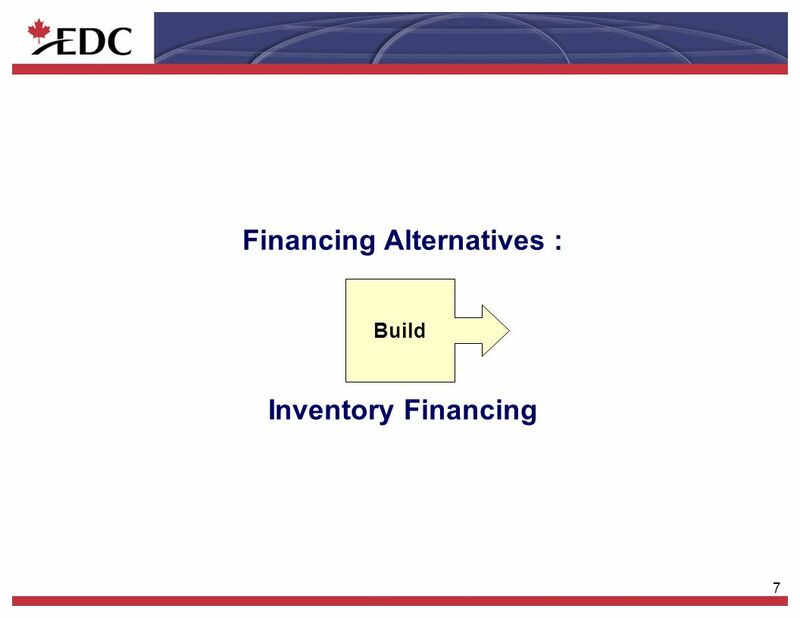 Banks and their products VOŠ – 3. ročník – 2. semestr. 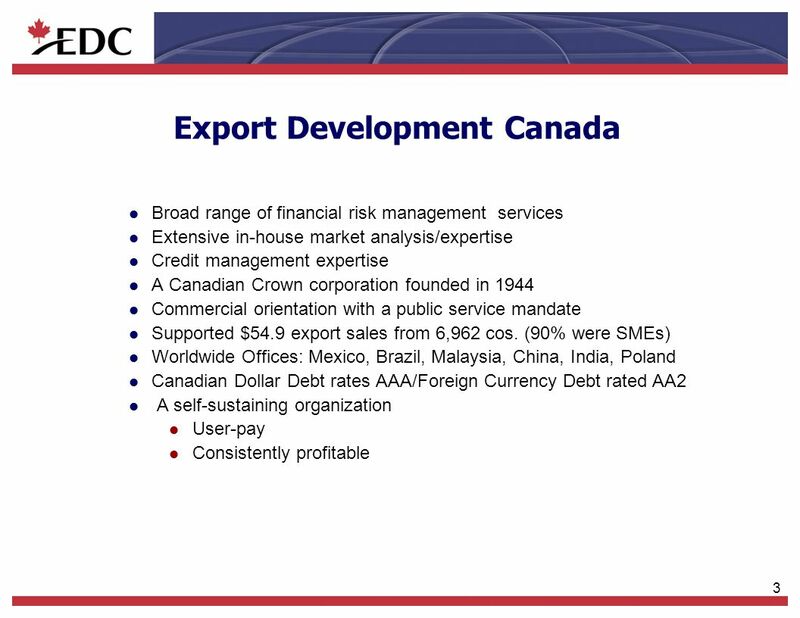 ACTIVITIES AND DEVELOPMENT OF EXIMBANKA SR 11 EXIMBANKA SR ITS ACTIVITIES AND DEVELOPMENT. 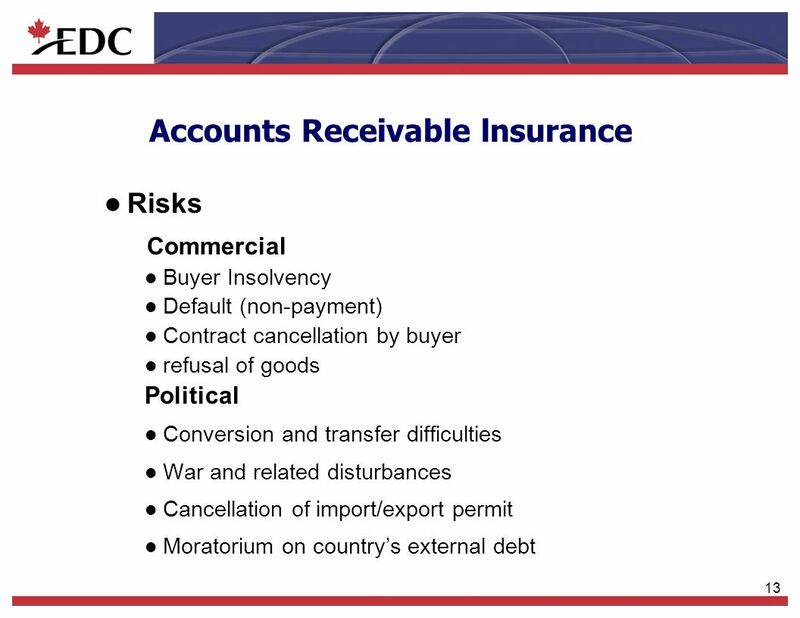 International Networking Credit & Political Risk May 2, 2006.